If you come to the Bahamas and you’re lucky enough to book in some dive time, seeing a trumpetfish is well worth the trip! This spectacular species thrives in the tropical waters of the Caribbean, Brazil, Gulf of Mexico, and the Atlantic Ocean. Divers and snorkelers can find Trumpetfish in depths anywhere between .05 meters to 30 meters (1.6 and 100 feet) and can grow to 40 to 91cm ( 15 to 36 in) in length. 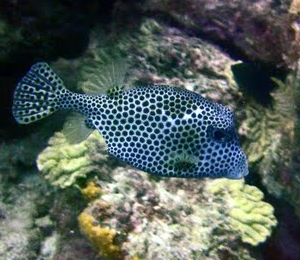 You will often find them poking around lagoons, and over coral atoll reefs. The Trumpetfish are cousins of the cornetfish, made distinctive by their elongated bodies, small frontal jaw, and tubular snouts. Their gills are resemble the teeth of a comb and their soft dorsal fin is located near the tail fin. If you can get close enough, you’ll notice a number of small spines along the front of the dorsal fin. The Trumpetfish comes in a variety of colors from dark brown to a greener tone, with flecks of yellow on some areas of the body. Sometimes a black streak can be found along the jaw. The Trumpetfish are very slow swimmers, and crafty predators! They use the element of surprise, sneaking up on their prey, or lying completely motionless like a stick in the current, waiting for the right moment! Not only are they quick and sneaky predators, they’ve also mastered the art of camouflage, swimming alongside much larger fish, as well as hiding amidst vertical coral like sea pens, pipe sponges and sea rods. 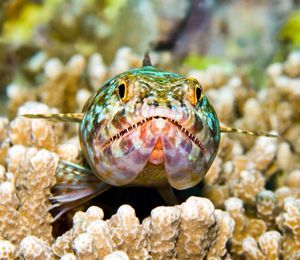 Their diet almost exclusive comprises of small fish such as Atheriniformes and wrasses, sucking them into their mouths like a miniature vacuum! 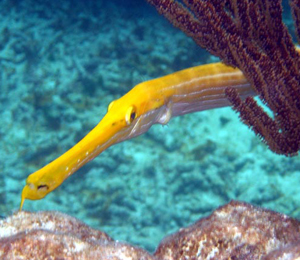 With their close proximity to the surface, its super sneaky predatory hunting and unique vertical grazing technique, the Trumpetfish is one of those fascinating species you could easily watch for hours. Don’t have hours? Bring your camera down, and snap a few shots for your underwater scrapbook!